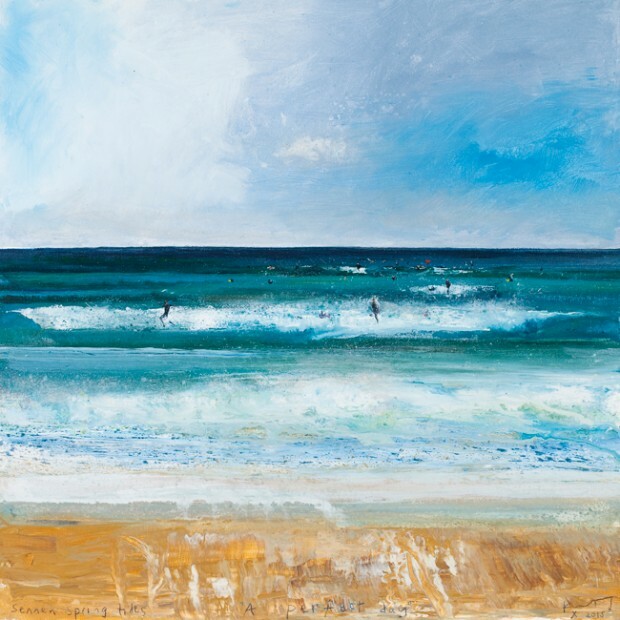 Kurt Jackson has partnered with Surfers Against Sewage to highlight our work to protect the UK’s oceans, waves and beaches for the launch show of his gallery The Jackson Foundation. The show consists of a series of paintings, sculpture and ceramics created by Kurt Jackson, a new body of work inspired by the last few years following his surf-obsessed studio assistant, George Kemp. The Jackson Foundation is a brand new gallery space created by Kurt and Caroline Jackson, based in a large ex-industrial building in the centre of St Just in Penwith, West Cornwall. With a desire to invest in the future potential of this part of the world and put their ‘politics’ into action Kurt and Caroline Jackson have built a green build/conversion using renewables and sensitive local materials and local labour. The Foundation will be supported by the on-going working practice of Jackson collaborating with environmental organisations and those groups interested in the natural world as well as parts of the educational establishment. The commercial element to some of the exhibition programming will feed into and sustain the Foundation, its aims and survival. Kurt Jackson’s work has a national and international following and by placing the Gallery in St Just a new link in the Art Loop will be created in Penwith: St Ives, St Just, Newlyn and Penzance – a trail of art and heritage attractions.